Find information on almost all places in Central African Republic. Whether you are looking for information on regions in Central African Republic or information on cities and places in Central African Republic, this website is the right place in the web to start your search. Central African Republic is a sovereign country on the continent of Africa. Central African Republic covers a total area of 622,984.0 km2 and has a population of approximately 4,844,927 people. 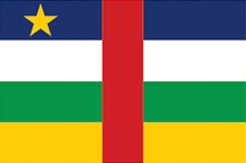 The capital of Central African Republic is Bangui (Bangui) with a population of 542,393 people. Compare the facts and figures of Central African Republic with other countries in Africa. Find your hotel in Central African Republic now. Book a hotel for your stay in Central African Republic. Show neighbouring countries of Central African Republic in map. There are 17 primary administrative regions in Central African Republic. Have a closer look at the regions in Central African Republic. There are 30 places in Central African Republic with a population of more than 10,000 people. View all large places in Central African Republic. Enter the name of the place you are looking for in Central African Republic in the search box and click on the button "Search". A few moments later, you will see all related search results of places in Central African Republic. If you prefer you can search any place in Central African Republic by first letter. Just click on the respective first letter in the index of places in Central African Republic. All places in Central African Republic starting with this letter will be listed. Also sometimes the full name of a certain place maybe unknown. Then this search option may also be usefull for searching such places in Central African Republic. You can click your way through the hierarchy starting from the continent Africa, over a region in Central African Republic to a certain place or city in Central African Republic, as all places and cities in Central African Republic are linked hierarchically to each other. The actual hierarchy is always displayed in the breadcrumb navigation, so you can always see exactly where you are.